St. Philip was from Bethsaida, the town of St. Peter and his brother, St. Andrew. He was called by Christ immediately after them to become fishers of men and Apostles of the Lord (John 1:43). After the Lord’s Crucifixion and Resurrection, the Apostles were sent out to the nations after Pentecost to preach the good news that Christ, the Son of the Living God, had come to earth to bring everyone to Heaven who wished to follow Him there. St. Philip was sent after Pentecost to preach the Gospel with the Apostle Bartholomew, first in Syria and Asia Minor, then in Lydia and Mysia, and then in Phrygia. Together with the Apostle John they killed a great serpent in Hierapolis, Phrygia by their prayers. After St. John left, they continued in Hierapolis, converted the wife of the governor, and then these two Apostles were crucified upside down, where St. Philip gave up his spirit. St. Bartholomew was taken down alive from his cross, later preaching in India and Armenia, where he died a martyr’s death. 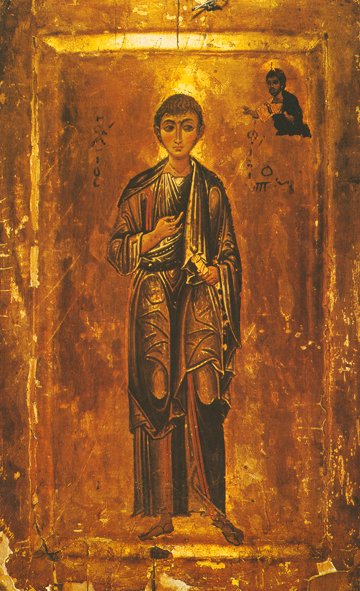 St. Philip is shown in this icon without a beard, which is the iconographic symbol that he was young, as he was before the Crucifixion.